The massive Aadlen Bros. U-Pick Parts wrecking yard in Sun Valley closed last week after 53 years. The 26-acre lot was filled with dismantled cars and oddities like a Helms bakery coach, a shoe-shaped vehicle, and three giant arches that once formed the long-gone googie-style Studio City car wash. Those were all donated to the Valley Relics museum in Chatsworth. 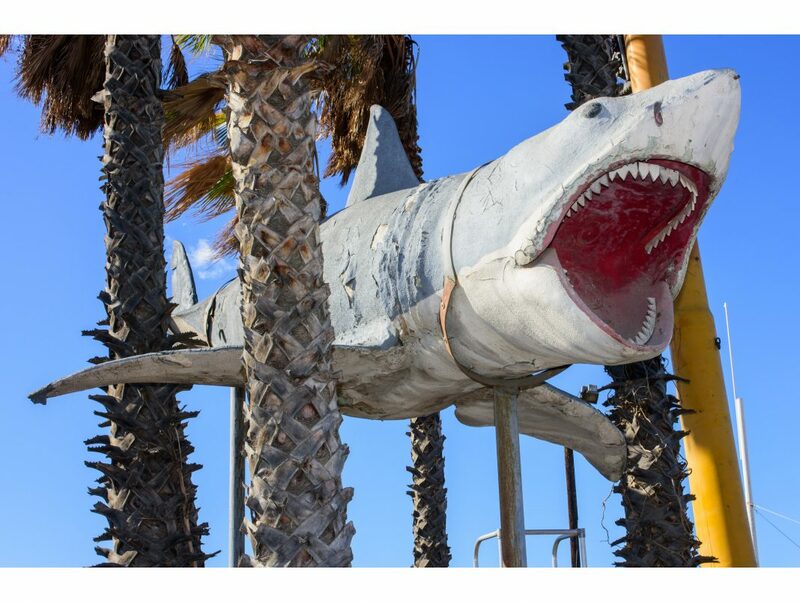 The yard’s most famous resident was a 25-foot fiberglass shark that had been hanging out in a grove of palm trees. The creature is the sole surviving full-scale model of the title character in the 1975 movie Jaws. The monumental model was created for display at Universal Studios Hollywood, where it remained a popular photo backdrop until it was removed in 1990 and sent to the junkyard. Owner Nathan Adlen donated the prop to the Academy museum where it will join the ruby slippers from The Wizard of Oz, a horse head from The Godfather, and more than 12 million photographs, posters, scripts and books in the museum’s collection. The museum is scheduled to open in spring, 2018 in the former May Co. building at Wilshire and Fairfax.